Two gay men were attacked in a park in southern California. Police responded to a call from a hospital in Isla Vista, an unincorporated community outside of Santa Barbara, at 9:30 p.m. this past Saturday. The two victims, ages 21 and 22, said that they were attacked by a group of six to ten teenagers in Estero Park. One of the attackers had a baton, and they said that the attackers made negative comments about one of the victims’ sexual orientation. The 21-year-old victim suffered a broken jaw and a laceration to his scalp. The other victim got welts across his back, a cut lip, and a shoulder injury. The Santa Barbara County Sheriff’s Office said that a bicyclist happened upon the scene and the attackers fled. The victims were able to flag down a car and get a ride to the hospital. 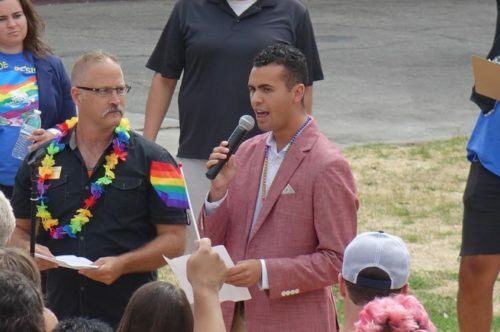 “It’s absolutely unacceptable that members of our LGBT community are facing violence here,” said Ethan Bertrand, Board President of the Isla Vista Community Services District. Bertrand said that there has been an increase in gang violence in Isla Vista and the police haven’t done enough to fight it. The Sheriff’s Office said the attack is being investigated as a possible hate crime and as a gang-related crime. No arrests have been made so far.